Regional health authorities were created in 1997 to better manage health care services closer to the patient. The number and types of health care providers needed to provide care have changed over time - but the health care system has not modernized in response. Between 2003 and 2016, health care funding rose by 97 per cent. These significant increases in health care funding have not resulted in significantly improved health outcomes, and Manitoba remains at or near the bottom of national rankings in a number of categories. Today, we have eight independent health delivery organizations - the five regional health authorities, Diagnostic Services Manitoba (DSM), CancerCare Manitoba (CCMB) and Addictions Foundation of Manitoba (AFM). Each of these organizations plans health services in relative isolation from one another, leading to duplicate services and inefficient service delivery while acting as an impediment to the development and implementation of a clinical services plan for all Manitobans. Now is the time to align how health-care services meet the needs of Manitobans. These transformative changes will strengthen health care in Manitoba and build a sustainable system for the future. The Manitoba Health, Seniors and Active Living Transformation Program has been established to guide the thoughtful planning and phased implementation of broad health-system changes aimed at improving the quality, accessibility and efficiency of health-care services across Manitoba. This charter defines the transformation program to form a baseline for ongoing management and assessment of overall success. The charter identifies the high-level scope of the program, including its role and mandate. The charter will ensure there is a sound foundation for governance of the transformation program, define the program's scope and structure and ensure all stakeholders have a common understanding of role and responsibilities program's key leaders, projects, outcomes and results. A Transformation Leadership Team has been established, including representatives from across the health system. The team is prioritizing transformation initiatives and making recommendations on governance and policy development. Members have been carefully selected to ensure robust links to both rural and urban health organizations, as well as to strengthen system knowledge across preventive, clinical and business health domains. The team's membership may evolve as the transformation progresses and as a governance model is finalized. Numerous studies of Manitoba's health system, including The Provincial Clinical and Preventive Services Planning for Manitoba report (also known as the Peachey Report), the Health Sustainability and Innovation Review undertaken by KPMG and the findings of the Wait Times Reduction Task Force have concluded that Manitoba's system is overly complex and, in many cases, acts as a barrier to effective and efficient delivery of services. The Transformation Leadership Team is in the process of developing a Transformation Blueprint and Program Roadmap that will provide the department and the broader health system with a clear and consistent view of where our health system is heading and how we will get there as part of the overall health system transformation journey. The transformation blueprint (the `what') is a description of the health system's destination i.e. 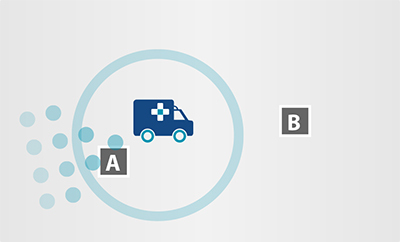 the "target state" of the health system when the transformation is well advanced. The completed blueprint will guide the transformation journey by providing a clear outline of the target state for all provincial health organizations. It will describe the role of each organization, the functions it performs in the target state, and the way each organization interacts with each other to achieve a more aligned and responsive health system for Manitobans. The program roadmap (the `how') is a description of the projects and activities required to get our health system from its "current state" (where we are now) to the "target state" (where we want to be) and ensure a successful transformation. Once complete, the program roadmap will include identification of individual projects, program‐wide activities, resource needs and a staging strategy that will help to guide the overall transformation journey. The transformation blueprint is currently in its final stages of development. Work on the program roadmap will begin shortly and will outline how and when transformation-related activities will unfold. Paramedics provide pre-hospital care to people who are sick or injured. This includes timely and safe medical assessment, treatment, and transportation services to health care facilities. Paramedics provide a high level of care from the moment they reach a patient until they get to a health care facility. In 2015/16, there were more than 110,000 calls for service in Manitoba. Plans to transform emergency medical services include the implementation of recommendations from the 2013 Manitoba EMS System Review. The review resulted in a recommended province-wide response time standard of not more than 30 minutes for 90 percent of the population, 90 percent of the time. In 2015/16, 95.52 per cent of calls south of the 53rd parallel met this standard during daytime hours and 94.67 per cent during night time hours. While this is good news, there is still more that can be done. Some sites have difficulty retaining enough staff to provide services and many rural stations are staffed part time, with staff on-call or called back to provide care outside of regular hours. This increases response times and costs, as staff first have to return to the station and then go out on the call. Other sites receive very low volumes of calls, which is not an efficient use of resources. Manitobans deserve to have predictable, reliable ambulance services right across the province. The 2013 review recommended the relocation or restructuring of a number of station locations across Manitoba (south of the 53rd parallel). These recommendations were validated by an expert task force made up of government and regional officials, as well as paramedics. This included reviewing data from Manitoba Transportation Communications Centres on call volumes and dispatch to identify opportunities to strengthen the system. These changes will allow us to better locate the services and match resources with actual call volumes to achieve response time standards. When an ambulance is on a call, resources can to be shifted to ensure the ambulance can respond quickly when needed. This work happens often in rural Manitoba to ensure coverage is available when people need it most. This is known as 'flexible deployment'. 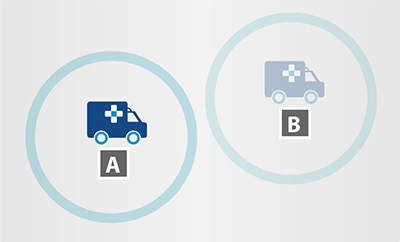 Community A and Community B both have ambulance stations. When the ambulance in Community B is sent out on a call. 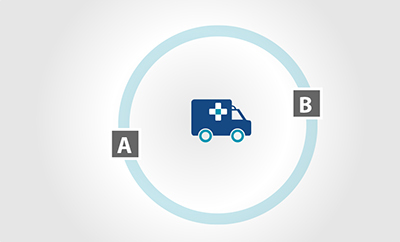 The ambulance from Community A is sent to a point in between the two communities. This ensures that both communities have ambulance coverage in case a second call is received. The first map shows the current number and location of EMS stations in southern Manitoba. There are daytime and nighttime drive time representations for each EMS facility. The second map shows the future number and location of EMS stations in southern Manitoba. Note that all stations will be operated 24 hours a day, seven days a week. Both maps show the areas that each station responds to, as well as the response times for each station.